xSellco Feedback is another module from the xSellco sales productivity range of apps. This platform facilitates feedback solicitation for products from satisfied customers at the appropriate time. In this article, we look at the xSellco Feedback pros and cons to provide you a good idea about the app’s strengths and drawbacks to help you gauge whether it is a good fit for your company’s specific needs. Our review team evaluated the main features and benefits offered by xSellco Feedback and have found it to be one of the best solutions sold in the market in its category. The vendor offers affordable pricing plans that are flexible for businesses of all sizes and with various budget needs. Plus, there is a great 14-day free trial offer that lets you try out the software’s main features at no cost. 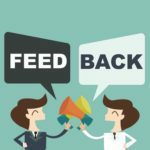 xSellco Feedback is more than a mere feedback solicitor – it manages reviews and distinguishes good ones from bad ones to give you a chance to respond quickly in all situations. You can use the system to convert reviews and feedback into profits utilizing the top quality metrics and social proof ratings. The software also sends notifications and motivates loyal customers to share their positive comments and feedback with others. Another interesting feature is the system is designed with a vast follow up capacity that reaches even busy customers, and helps you boost your sales and revenue. xSellco’s feedback requests are selectively targeted at satisfied customers who buy the product you’ve chosen. Along with product types and delivery details, the application also takes stock keeping units (SKUs) into account, as well as competition reviews, locations, and purchase histories. It can be currently used on Trustpilot, eBay, and Amazon, and you can also utilize the open APIs offered by marketplaces to expand XSellco’s usage to other platforms as well. What makes xSellco Feedback the platform of choice for numerous top businesses? To get the answer, let’s take a detailed look at the key advantages and drawbacks of this platform. xSellco Feedback automates feedback requests on all the channels you are using including eBay, Amazon and several others. You simply have to schedule the products and emails you wish to send or you can let the system decide and automate it for you. The platform distributes them selectively and carefully. It also offers a built-in editor that helps you personalize and fully customize the emails with HTMLs or plain text. After delivering the feedback requests, xSellco manages their performance and knows who has responded. It does more than notify you that a product has been reviewed as it offers a you a detailed history of the reviewer’s behavior, and reselects them based on their purchase history, satisfaction, and location. 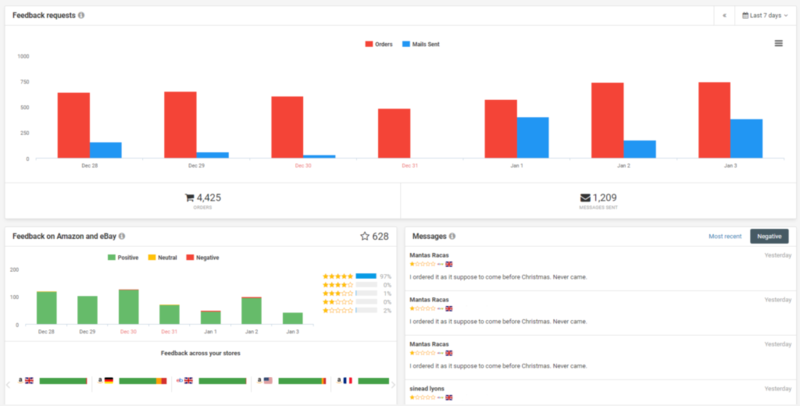 All these details are displayed in a neat dashboard, where all responses are placed by customer, and all seller ratings are collected to present a consolidated picture of your feedback performance. xSellco offers excellent feedback control in the form of detailed rules that are compliant with widely used feedback policies. Another notable feature is that specific criteria are used to choose customers smartly. The app selects reviewers based on purchase history, location, satisfaction, and delivery times, and avoids those who did not receive products on time. xSellco uses customer information to select appropriate messages for them and informs you when you receive a bad review for your product. You can use this app to get a 5-star rating and to perfect the values of your metrics. Another helpful element is you can boost the effectiveness of your feedback strategy by using the application’s A/B testing to design better methods to target reviewers. Our analysis of the system reveals that it is really good at preventing users from getting exposed to spam and bad comments. Another major benefit is xSellco Feedback smoothly integrates with xSellco Helpdesk and this linkage ensures that customers who have a support ticket history are not targeted to give feedback. You can turn reviews into revenue as xSellco helps sellers to proactively encourage positive feedback, which improves social proof ratings and seller metrics, resulting in quicker sales growth and more revenue. You can make smart and selective requests by asking for feedback on the right products from the right customers at the right time. You can tailor feedback requests by destination, on-time delivery, product type, SKU and more. You can generate reviews even when you are offline by automating your feedback requests. xSellco allows you to communicate with the same messages to customers whether they buy from your webstore, eBay, or Amazon. You can boost feedback potential by setting the app to deliver your messages at a time of day when customers are more likely to read and respond to your feedback request. For more information about XSellco Feedback features check out our detailed review of the software. In our detailed analysis, we tried to find elements that could be improved by the vendor, but currently xSellco Feedback provides a good performance in all aspects. The vendor constantly works to improve the system and quickly fixes minor bugs as soon as they are identified. An online search reveals that there are no negative comments and opinions about this product. Perhaps the only area that needs improvement is integrations which can be expanded to include more third party apps. Our detailed evaluation of the xSellco Feedback pros and cons shows that the software offers many positive features and does not seem to have any noticeable drawbacks. You are sure to get good value for money by investing in any of the flexible and affordable pricing plans. There is also a convenient 14-day free trial plan you can use to learn if the solution suits your needs before you invest your money.